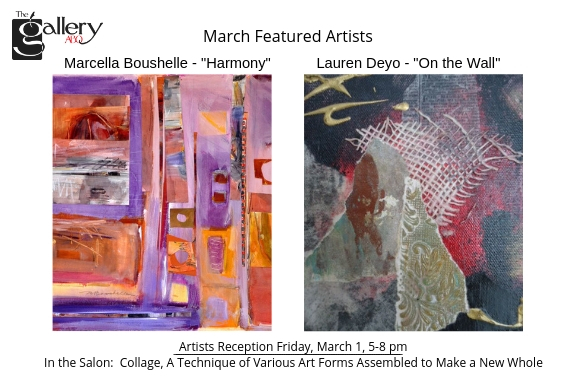 This month our Featured Artists are Marcella Boushelle and Lauren Deyo. Marcella and Lauren are both mixed media artists. Marchella describes her work as abstract and impressionistic. She hopes her art conveys to the viewer the same energy and excitement that she feels when she paints. Lauren has a love for oriental brush painting which has influenced her work in mixed media and collage elements developing her abstract expression. In the Salon will be featuring “The Magic of Collage”. Collage is a technique of various art forms assembled to make a new whole. We are proud that this month both of our featured artists have a love for collage. The Gallery is still accepting applications for NM Collage artists. For more information go to https://thegalleryabq.com.